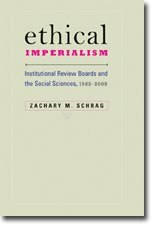 Craig Howes, professor of English and director of the Center for Biographical Research at the University of Hawai‘i, Manoa, acknowledges the ethical challenges of biographical writing but seems to doubt that IRB review is the appropriate tool for handling them. No institution worried about litigation will let its researchers decide unilaterally whether their research is exempt. The result? Many of us apply to the IRB for an official ruling that we don’t need to apply for. This Catch-22 can lead to confusion. At least one university IRB simply refused to accept any human subject research requests from the English department, though this policy was later rewritten by an arts, law, and science research ethics board. Conversely, some researchers refuse to seek IRB approval on ethical grounds, claiming that permission can lead researchers to believe that anything is fine, as long as they don’t violate the protocols. And Howes stops short of calling for IRBs to review biography, since the regulations remain wedded "the assumption that subjects will be guaranteed anonymity and that the interviews will be destroyed after the relevant information has been extracted . . . the IRB assumption is still problematic, because for most humanities interviews granting anonymity and destroying the tapes and transcripts would make the whole exercise pointless." The problem is not that federal regulations require such destruction. It is bad enough that they take anonymity and the destruction of recordings as the norm and the creation of a historical record as deviant from that norm. I think that Howes isn't far from the position I took in 2007 and which I still hold: learning about the ethical practices of other disciplines can help scholars think about their own ethical duties. But when governments and institutions impose foreign practices on researchers, they breed resistance and cynicism.